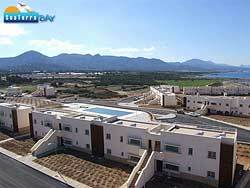 SeaTerra Bay is one of the best properties listed in Cyprus44 property reviews. 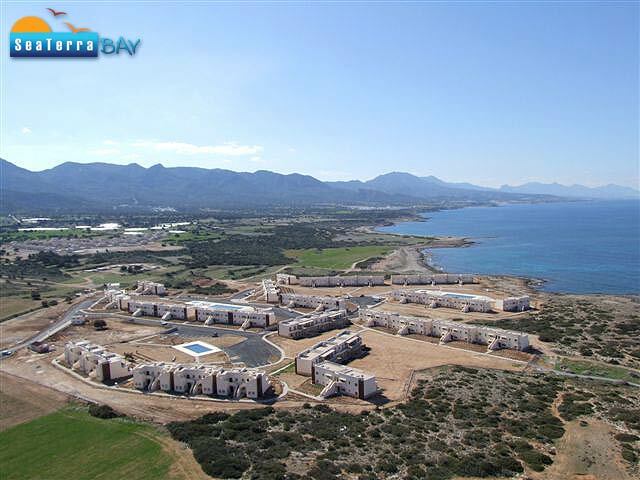 In developing a range of North Cyprus property sites, SeaTerra can draw on years of experience in the Spanish property markets, and the backing of international investors. SeaTerra is the first North Cyprus property development company to gain an ISO 9001 accreditation for the quality of their management. Of course, the real proof is in the delivery of quality homes on time, and SeaTerra have already done exactly that for over 250 satisfied customers. Like all SeaTerra developments, the SeaTerra Bay site lies within 15 minutes' drive of Esentepe's major attraction, the Korineum Golf Course and Country Club. 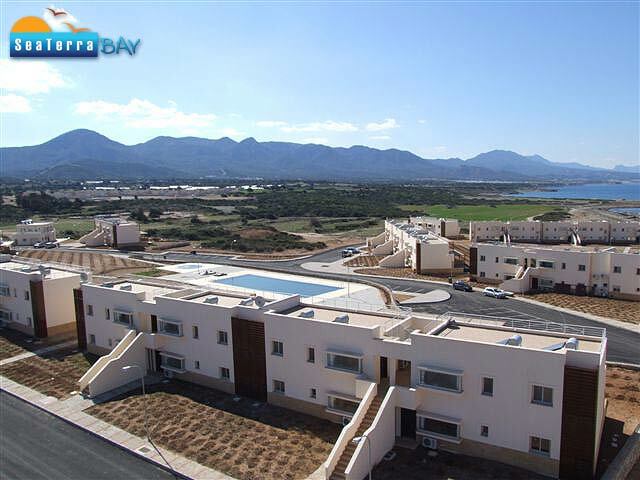 Unlike all their other developments, the site at SeaTerra Bay is just 50 metres from the coast, as close as you can get thanks to government protection of all North Cyprus shoreline. In fact, you get much more beach that you might expect, as the coastline bulges out to form a crab-claw shaped peninsula of sand just metres from your front door. Situated next to a conservation area, the SeaTerra Bay development offers both garden and penthouse apartments set in landscaped gardens right above the beach. Needless to say, such an amazing location provides great views out across the sparkling Mediterranean Sea and back towards the Five Finger Mountains behind. The SeaTerra Bay two storey apartment buildings are carefully arranged such that each block is offset from the one in front, maximising those sea views. A central road leads to the heart of this roughly circular development, ensuring that no property is too far away from any facility - or that beach! The three bedroom garden apartments are carefully arranged so that the two back bedrooms both have access to the small terrace and garden area beyond, while the living room also opens onto a separate terrace area with a pergola. So, wherever you are in the apartment, you are never far from that glorious North Cyprus sunshine! The two bedroom garden apartments are slightly larger than the two bedroom penthouse apartments, and the one-bedroom penthouses are perhaps a little on the snug side at just 50 square metres of space. Each apartment features ceramic tiling throughout, a fitted kitchen, high quality branded white goods and double-glazing, as one might expect. Air conditioning is provided in the living room and the master bedroom, and satellite tv is available too. The gated complex offers a high level of security, and there is also an onsite management and maintenance company. Options for cleaning services and rental management on site as well make SeaTerra Bay properties ideal to rent out without worry, or to simply ‘lock and leave’ between your own breaks in the North Cyprus sunshine. Investors and holiday-makers alike have already snapped up the cheaper apartments, but excellent properties are on offer in Zones A and B, from £63,000. This web page is served on 20 April 2019 at 00:11:49.